Florence is absolutely wonderful, of course, but it’s also insanely crowded, and to get a better taste of the real Tuscany you need to go somewhere a bit quieter. 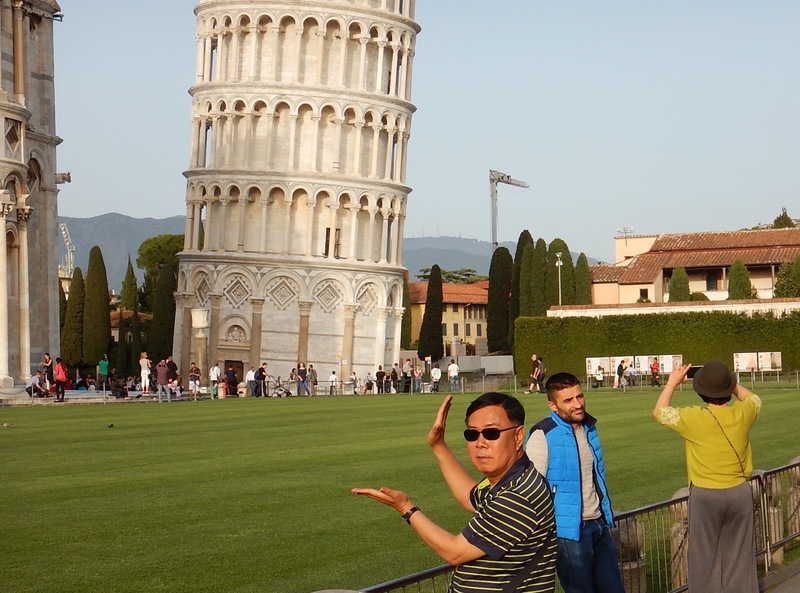 Pisa is also ridiculously busy by day, but less so by night, and of course it’s well worth a visit anyway. The street on the south side of the duomo, baptistery and leaning tower is now selfie avenue, and thankfully it’s now closed to motor traffic, otherwise there’d be constant accidents. I found it quite entertaining (briefly) trying to take photos of rows of people being photographed holding up some random bit of sky. The area is also busy with Africans selling watches – how do they make a living? In fact quite a few of Pisa’s sights were closed for refurbishment, most notably the Museo dell’Opera del Duomo, which closed in 2014 and won’t reopen before 2018 – this houses many of the treasures of the cathedral (mostly sculptures, communion vessels and other liturgical objects); in the Camposanto the room with the paintings by the Master of the Triumph of Death was also closed. We noticed that many of the stunning carved Renaissance pulpits here and elsewhere in Tuscany were being restored – mostly hidden away behind wooden hoardings bearing images of the pulpit, but that’s a poor substitute. The museums that are open could do with improving their English translations. The good news is that the Museo Nazionale di San Matteo (8am-1.30pm Sunday, to 7.30pm other days; €5), down by the river at Piazza San Matteo, is delightfully unvisited, an absolute haven from the bustle around the leaning tower. In a 13th-century Benedictine nunnery, it houses many treasures from the Pisa area’s churches, notably 12th- to 14th-century paintings by Lippo Memmi, Fra Angelico, Taddeo Gaddi, Gentile da Fabriano, Ghirlandaio, Masaccio and Simone Martini. There’s also a fine collection of 14th- and 15th-century Pisan sculpture, including pieces by Nicola Pisano and his son Giovanni, Andrea Pisano and his son Nino, Francesco di Valdambrino, Donatello and Michelozzo, and terracottas by Andrea della Robbia. The railway branch from Pisa station to the airport (the busiest in Tuscany) has been ripped up and is being converted into the high-tech PisaMover automatic shuttle – it closed in December 2013, supposedly for two years, but when we were there in April 2016 the new tracks had yet to be laid and re-opening had been put back to December 2016. It may be open by the time I post this but I wouldn’t bet on it. While it’s closed your PisaMover service is actually a bus shuttle from the rear of the station (a longish walk – every 10min 6am-midnight, €1.30 in advance or €2 from the driver). In any case it’s often better to take the regular Lam Rossa buses from the airport which will take you closer to where you actually want to go. We were lucky enough to find a fabulous, spacious apartment (for six) with a garden just a stone’s throw from the leaning tower. The owner Gabriella was very helpful and it was easily accessible from the airport by bus. Lucca, a short hop north of Pisa, really is more peaceful, although it has treasures of its own. Its Renaissance walls (finished in 1650, too late to ever be attacked) are still intact, with a largely traffic-free centre inside them, with lots of relaxed cyclists; they now make a delightful 4km circuit on foot or bike. At the heart of the old town is the Piazza dell’Anfiteatro, an oval space on the site of the Roman amphitheatre; it’s ringed by medieval houses, but at their rear you’ll see fragments of Roman stonework incorporated in the later buildings. In addition to the duomo (cathedral) there are several other Romanesque churches that are well worth lingering in – San Michele in Foro and San Frediano are particular favourites. Diagonally opposite Puccini’s birthplace (Corte San Lorenzo 9) is the relatively new Puccini Museum (March–April & Oct-Nov 10am-6pm daily, May-Sept 10am-7pm daily, Nov-Feb Wed-Mon 10am-1pm, 3-5pm; €7). The Puccini family were the cathedral organists for at least five generations before Giacomo achieved global fame for his operas. The lesser-known composers Boccherini and Catalani were also born in Lucca. 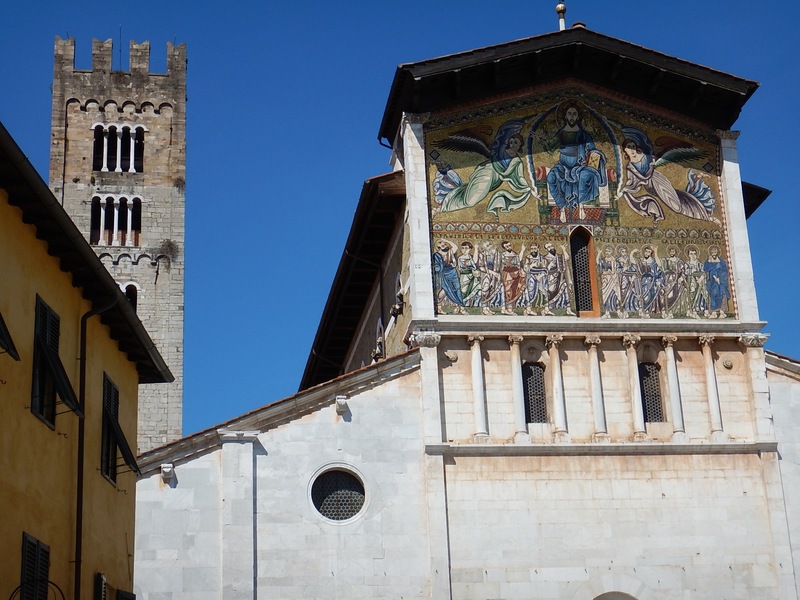 Lucca also makes a good stop on a couple of long-distance hiking and cycling routes. It’s hoped that the Via Francigena, following the medieval pilgrim route to Rome, will rival the Camino de Santiago as a long-distance challenge. A cycle/pedestrian bridge has been built across the Serchio river on the north side of Lucca, and seems a typical European project, left half-finished for a couple of years then very underused, being of little use to anyone except the few tackling the Via Francigena. A more popular cycle route leads west from Lucca to the sea along the river, and also inland towards the 15/16th-century Villa Reale, Villa Mansi and Villa Torrigiani, set in magnificent gardens. The area of the current bus station, just inside the Porto Vittorio Emanuele, is rather tatty and there’s a plan to move the buses to the railway station, which would make a lot of sense. LAM buses link Lucca with Pisa and also the airport – the fare is just €3, but be aware that the last buses leave early, ie mid-evening. The Lucchese are known for being conservative, and tight with their money, and they stick to the typically meat-heavy Tuscan diet as far as possible – a fine Sicilian restaurant was able to survive only if its menu was half Lucchese. Lots of Lucca’s cooks are in fact Sri Lankan, immigrants who started as dishwashers and worked their way up, while the African immigrants are still selling sunglasses (but unfortunately they’re learning the Tangier patter, ‘Hi, where are you from?, to draw potential buyers in). One excellent restaurant is Canuleia Trattoria (via Canuleia 14), with tables in a nice garden; it’s also worth heading a few kilometres west on the riverside cycle route for the workers’ lunch at Alla Cantina del Carignano (Via Per Sant’alessio 3680, Carignano). The best (organic) ices are at Gelateria Grim on the main street (via Fillungo 56). The ‘Chicken Bar’ (you’ll understand when you see it) on the north side of the San Michele church is one of the town’s few late-evening bars; it’s also known as Il Peschino (after an alcoholic peach drink) or the Caffé del Mercato. We stayed with friends who are now offering accommodation through AirBnB. Their lovely home has been a labour of love. Elegant, comfortable and spacious. I cannot recommend it too highly and, in particular, I loved the location – it’s hugely convenient for the town itself and for doing the circuit of the city walls on foot or by bike. If you get the chance to eat with Carol, then take it! She’s a great cook and David is an attentive host. I hope to bring my mother there next year.